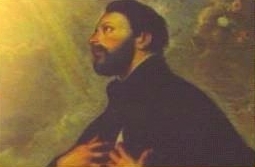 The church has called St. Francis Xavier the most outstanding missionary since Saint Paul, the Apostle. Francis was born in 1506 at the castle of Xavier in the Kingdom of Navarre, Spain. By the time Francis was nine, the death of his father and the invasions of Navarre had exhausted the entire family fortune. Nevertheless, he continued to study. In 1529, Ignatius of Loyola came to Paris to study. He soon became acquainted with Francis. Ignatius was older and neophyte in the ways of scholarship. Francis, at the peak of his intellectual career, had little or no sympathy for the older student. Gradually, though, Ignatius succeeded in winning the young man's confidence and in convincing him to look carefully into the problem of ultimate human concern. On August 15, 1534, Ignatius, Francis, and five others took the vows of chastity and poverty. The group remained in Paris for two more years to complete their studies. In 1536, with three new companions, they settled down in Rome, preaching and living on alms. Francis was ordained in Venice in 1537. In 1540, when the Society of Jesus was approved, Ignatius became the first general. In responding to the request for missionaries to the East Indies, Ignatius appointed Francis. His ship left Lisbon on April 7, 1541, and after a long and painful voyage, Francis landed at Goa, India, on May 6, 1542. He became as a stranger to the land. First, he sought to know the people, to understand their customs and, by this attitude, to convince them of his sincerity. Since love of neighbour is at the core of Christianity, he spent countless hours ministering to the sick and poor, particularly the lepers. In 1545, he moved on to the East Indies, landing at Malacca on the Malay Peninsula. Gradually, with gentleness and tact, he induced many to accept Christ as their Lord. He entered Japan in 1549 and was constantly badgered by hostile islanders. However, he was successful in a few cases. to convince him and his subjects of the truth of Christianity. On December3, 1552, while attempting to carry out this new mission, he died at Shang-chuen, a small island off the coast of China. Francis Xavier was canonized in 1662 together with his friend, Ignatius Loyola. Giving up a successful career as a scholar and philosopher, Francis chose to work with the poor, the oppressed and the outcast, preaching the good news to them. This spirit of sacrifice is a fit example of being "resolute in action". When he found that God's love is the most important thing in life, no difficulty could stop him. Pope Pius X proclaimed St. Francis Xavier Patron of the Faith and Pope Pius XII in 1927 named him Protector of the mission. Navigators honour him as their patron. St. Francis Xavier’s work remains, in spite of persecution, schism and other difficulties. He inspires many missionaries even up to the present. In fact, Francis is one of the truest and most captivating heroes the world has ever known.